Safety is the number one priority for runners who are out at night. Without the proper tools, it can be difficult for drivers to see pedestrians, which increases the risk of unfortunate accidents. LightGuide LED lights are made to keep runners safe in the dark. They are made with high-performance reflective technology to provide bright security light after the sun goes down. You'll be safe from motorists thanks to the visibility up to 1/3 of a mile provided by these LED lights for runners. Get at least one of these reflective safety light products to help keep you safe from drivers who may not be able to see you in the dark. These running LED lights are available as arm bands, belts, hat clips, shoe clips and multi-use bands. Choose whichever option you're most comfortable with or purchase more than one for increased visibility. LightGuide LED arm bands for runners are made from reflective material and are equipped with blinking lights. Made from tough nylon, these arm bands are durable and versatile. Wear one around your arm or leg and choose from three different light modes. 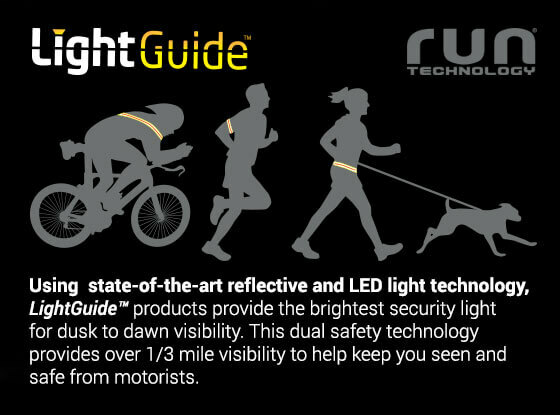 The LightGuide running LED waist band provides the same benefits as the arm band in a larger size. Wear this reflective, lighted belt around your waist or as a sash. We also offer LED Slapn'Go safety light bands that can be worn on your arms or legs. Simply slap the band to attach it to your limbs. If you like to wear a cap when you run, our LightGuide LED hat clips make a great nighttime running light. These lights easily clip to the bill of a baseball cap in order to shine light on the ground in front of you. Hat clip lights are a great hands-free way to increase your visibility during nighttime runs. This hat light can also be clipped to belts and backpacks. Another easy way to make yourself more visible to nighttime drivers is with our LightGuide LED shoe clips. These clips easily attach to your shoes to provide light reflection as well as blinking LED lights. Lightweight and durable, these lights attach to the heel area of your running shoes.